When you have a small skin infection and your skin gets red, swollen and painful, you know it as inflammation. Because it happens quickly and the cause is clear, it’s referred to as acute inflammation. 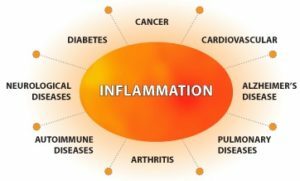 There is another type of inflammation that many people never realize they have. It’s not visible on your skin and you can’t see or feel it anywhere. Healthcare professionals know this as chronic inflammation and it affects your entire body. The exact process of how inflammation starts and what triggers it is not fully-understood. Medical researchers do know that it starts with the immune system. Our immune system is designed to fight diseases. However, when chronic inflammation starts, the immune system sends out white blood cells to defend against an infection or injury even when there isn’t one. Over time, the white blood cells end up attacking healthy tissue. They can even damage other disease-fighting cells, leaving our bodies open to diseases such as cancer. Some causes of inflammation and later results are known. The first is excess weight. When we gain too much weight, fat cells bulge and become stressed. This causes a hormonal “SOS” according to University of California, San Diego endocrinologist Jerrold Olefsky. This distress call to the immune system causes white blood cells to respond, inflaming the cells that called for help. Over time, this makes the cells insulin resistant, starting the cycle that can lead to diabetes. Another cause for inflammation is emotional. According to psychoneuroimmunology researchers at the University of California, Los Angeles led by Dr. George Slavich, repeated bouts of anxiety, such as stress at work or at home, can cause inflammation spikes. The inflammation spikes can in turn lead to other health problems, including diabetes, depression, sleep disorders and heart disease. And finally, the third known cause for inflammation was revealed in Environmental Health Perspectives: poor quality air. Air pollution was found to contribute to inflammation and those living in high-pollution areas were found to have higher rates of inflammation than those living in environmentally-clean areas. However, the biggest cause of “bad air” is well-known for all of its poor health effects: tobacco. Smoking directly assaults lungs. When our bodies release natural immune responses to defend against smoking injuries, they can often overcompensate, leading to cancer, lung disease and even insulin resistance and diabetes.